SNAP (STOP NOW AND PLAN) – a simple technique that causes children to stop and think before they act and make better choices “in the moment”. This 13-week program is delivered in the classroom by Boys & Girls Club Staff. SNAP concepts are taught through discussion, role play, activities and relaxation techniques. Avoid trouble and become GREAT Problem Solvers! Stopping themselves (e.g. by counting to 10 or taking a deep breath) as soon as their body begins to react (e.g. throbbing head, tension, feeling hot). We call these reactions body cues. Identifying any hard thoughts (e.g. “he’s doing that to make me mad”) and replacing them with helpful/realistic coping statements, or cool thoughts (e.g. “I can handle this”). 3) makes them feel okay. What if we told you that SNAP can actually ‘reset’ a child’s brain in just 13 weeks? In a study jointly conducted by The Hospital for Sick Children and the University of Toronto, leading researchers found that as children learn to use SNAP and develop self-control and problem-solving skills, there is increased activity in the regions of the brain responsible for monitoring self-control. 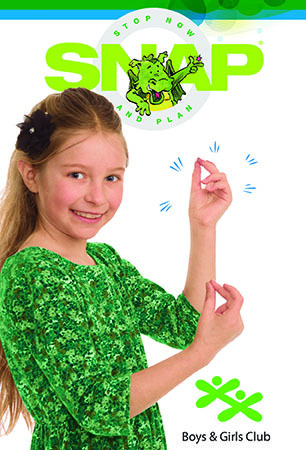 Boys & Girls Club Miramichi is a licensed SNAP® Affiliate. For more information, call 778-2444 or email us at contact@bgcmiramichi.com.